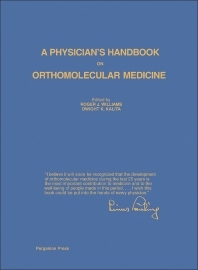 A Physician's Handbook on Orthomolecular Medicine is a collection of articles that covers the advancement in the field of orthomolecular medicine. The title presents papers that discuss the methodology and technology involved in the adjustment of the natural chemical constituents of our bodies, along with related concerns. The book aims to further promote orthomolecular medicine by discussing its effectiveness and efficiency as a form of medical treatment. The coverage of the text includes orthomolecular medicine’s application in treating mental disorders and regulating disease. The book will be of great use to students, researchers, and practitioners of health sciences. 1 Orthomolecular Medicine: "We Command Nature Only by Obeying Her"
5 On Sugar and White Flour: The Dangerous Twin!